Invite as many candidates as you need to profile. Send online invitations with just a single click. Profile questionnaires are handled completely online. Analysing the answers is all managed automatically. A densely detailed individualised report is compiled instantly for any DISC profile. Choose from a library of hundreds of different roles, or create your own using the built-in Job Profiler. Compare any two candidates to understand their relationship from both perspectives. Combine reports for any number of candidates to generate an in-depth team analysis. Give your candidates feedback on their personality results using the specially developed Feedback Report. The specialised 'Motivation Spectrum' report focuses in on the motivational factors that drive an individual. 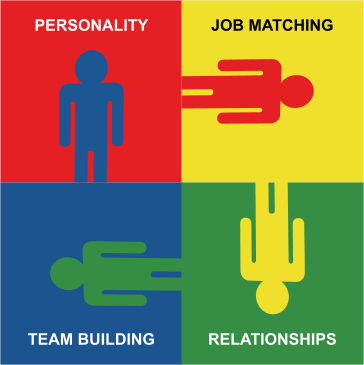 Customise your candidates' profiling experience by adding your own corporate identity to personality profiles and reports. Discus has been constantly developed and improved over the last 25 years. The DISC personality system has been independently reviewed for its validity and reliability. A worldwide profiling solution, DISC profiles and reports are available in dozens of languages. Profiling and reporting runs across the Web on any system or platform, from your desktop to your phone. You can find full details of our introductory packages, including package prices, on our Purchase page. A full report on the validity and reliability of our psychometric assessment is available in the Roodt Report. See our Reliability and Validity section for full information. We're always happy to answer any questions you may have. You can get in touch with us by phone, Skype or e-mail using our Contact page. If you're in a hurry, why not use our Callback service? Just pick a time, and we'll call you back to discuss any questions you have. Signing up for Discus just takes a few minutes, and gives you a world of personality profiling at your fingertips.